Common Yellowthroat. llustration by Bartels Science Illustrator Jessica French. 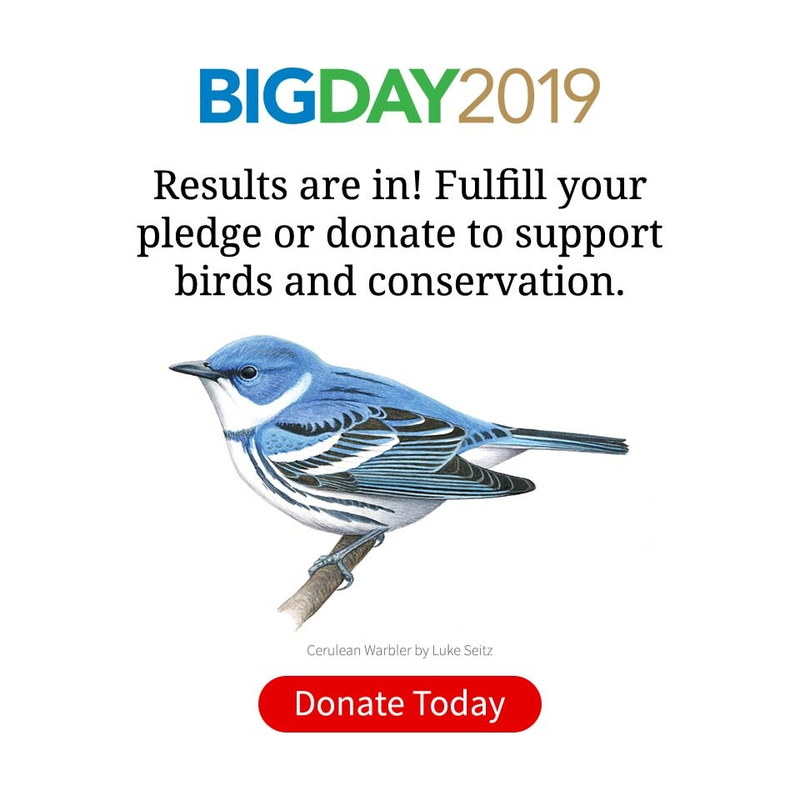 From the Spring 2019 issue of Living Bird magazine. Subscribe now. A broad black mask lends a touch of highwayman’s mystique to the male Common Yellowthroat. 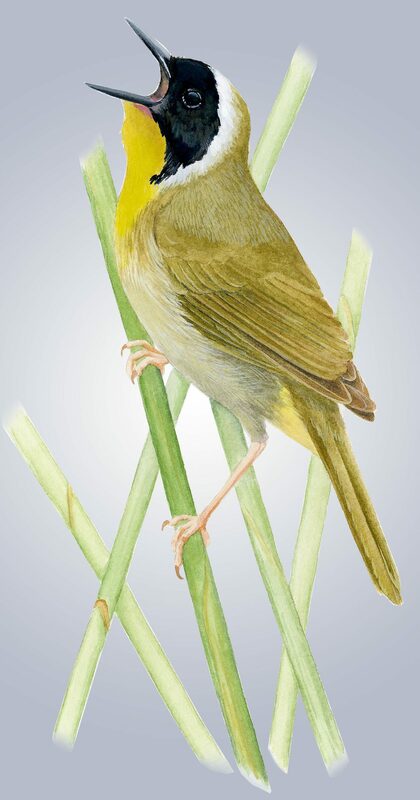 Look for these furtive, yellow-and-olive warblers skulking through tangled vegetation, often at the edges of marshes and wetlands, and listen for their distinctive witchety-witchety-witchety song. Find This Bird: Visit shrubby habitats in spring and summer and keep an ear out for the male’s wichety-wichety-wichety song. If you hear it, look low in bushes and trees. You can try making a pishing sound; yellowthroats are inquisitive birds and often pop into the open to see who’s making the sound. New Distribution and Abundance Tools: eBird Status and Trends tools reveal fascinating insights about the abundance and seasonal distribution of Common Yellowthroats. Learn more about how to read eBird Status and Trends maps and other tools. Year-round Abundance: Common Yellowthroats are common warblers across most of North America. Most populations migrate; some go short distances, while others journey all the way to Central America, flying back across the Gulf of Mexico on spring migration. Some populations in the South and Mexico stay in place year-round. See the full suite of eBird Status and Trends tools for this species. Breeding Trends: The North American Breeding Bird Survey measured a 38 percent decline in the yellowthroat population between 1966 and 2014. eBird maps show declines to be most pronounced in the Northeast. Because they eat insects and often live in wetlands, yellowthroats are susceptible to poor water quality, pesticides, and other pollutants. The Common Yellowthroat was one of the earliest species of birds to be described from the New World, first collected in what is now Maryland and described by Carl von Linné (Linnaeus) in 1766. Each male yellowthroat normally has only one mate in his territory during a breeding season. However, a female’s mating calls often attract other males, and she may mate with them behind her mate’s back. One subspecies of Common Yellowthroat is a year-round resident in the Rio Grande river delta in Texas. These yel­lowthroats are not only territorial among themselves, they also keep migrating yellowthroats completely out of their habitat.